Mason Jar Dessert Cups are a very fun, cute, and creative way to serve up a treat or send people home from a party with a yummy little favor. 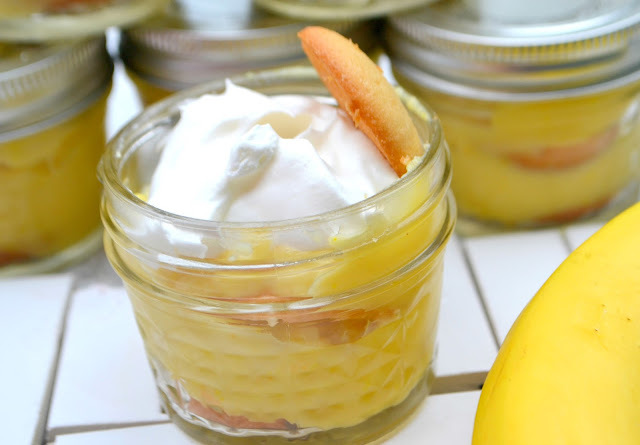 I recently had a baby shower to help with and made these fun little jars of Banana Cream Pie for the party. I used my Banana Cream Pie Recipe which is so delicious and easy! Click here for the link to my Banana Cream Pie recipe. 1 (8 oz) carton whipped cream. Place clean mason jars on a large tray or cookie sheet. Dice bananas and lightly sprinkle with lemon juice to help preserve color. Mix diced bananas into prepared pudding. Layer 2 heaping Tablespoons of pudding mixture on top of the cookies. Repeat with the Pudding mixture. Spread 2 Tablespoons of whipped topping on top of last pudding layer. 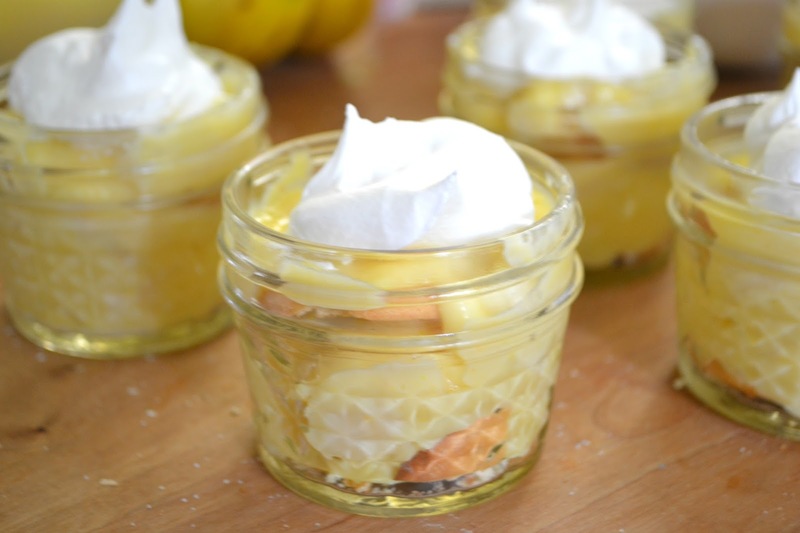 I also used my no bake Cherry Cream Cheese Pie recipe to make mini jars of cheesecake cups. Made the cherry cheese pie filling and layered exactly the same as above. Top with cherry, strawberry, or raspberry pie filling. The Banana Cream Pie Recipe also has options using the same recipe to make Peanut Butter Snickers Pie and Chunky Monkey Pie. These would make Super tasty dessert cups! Chunky Monkey Cups : A creamy peanut butter flavored pudding with an Oreo base but with banana chunks. Use an Oreo cookies instead of the vanilla wafers. Mix the diced bananas into the peanut butter pudding, top with whipped cream. Peanut butter Snicker Cups: make the Peanut Butter Pudding from the Banana Cream Pie variation. Stir in the diced snicker bar chunks. Layer the pudding cups with either vanilla wafers or Oreo cookies. and top with whipped cream. So cute! I think I'm going to have to make one of these recipes the next time we entertain! "So cute" is exactly what I was thinking too! And I adore banana pudding. This is a perfect, simple dessert for company! I love making simple desserts seem just a bit more special. Not that much work, but you still have everyone thinking you did! My husband has recently fell in love with banana pudding. This would be a wonderful way to present him with his very own serving. thanks.